Some nutritional components have added benefits when taken in large doses. There can be a considerable difference between a dose to maintain health and a dose to alter physiologic function. Such is often the case in the treatment of a disease process. For magnesium, the dose to maintain healthy function in adults is roughly 400 mg/day, whereas a dose of up to 2000 mg/day may be indicated to treat certain conditions (1). The safe tolerable limit for magnesium is approximately 2500 mg/day in healthy adults (2). Achieving these higher doses most often requires supplementation. Magnesium citrate is becoming the supplement of choice for many practitioners, as it is highly bioavailable, well tolerated, and affordable (3). The therapeutic benefit from magnesium relates directly to its normal physiologic action. It relaxes all types of muscle in the body, which means that it can help offset or ease any condition that has hyper-excitable muscle as an underlying cause. For example, magnesium given intravenously within the first hour of arrival at the hospital following an acute myocardial infarction (heart attack) improves short and long-term complications, and lowers death rate (4). It does this by relaxing the smooth muscle of the coronary arteries, allowing them to dilate, which improves blood and oxygen delivery to the heart muscle (4). The calming effect that magnesium has on muscle has many clinical applications. In asthmatics, the smooth muscle lining the lungs becomes constricted, and magnesium helps to relax it, allowing the bronchioles to dilate and permit more oxygen uptake (5). It helps ease the muscle tension and vasoconstriction underlying the development of tension headaches and migraines (6). It calms the cramping and spasms in uterine muscle for women with dysmennorhea (7). Similar logic can be applied to explain the therapeutic benefit of magnesium in many other conditions such as hypertension, angina, restless legs, and stroke. People who have a history of forming calcium kidney stones should consider supplementing with magnesium. The solubility (ability to dissolve in water) of calcium is greatly increased by magnesium, allowing it to be flushed through the urine, greatly reducing prevalence and severity of stone formation (8). Fibromyalgia is another condition that has shown improvement with magnesium supplementation. Sufferers of fibromyalgia often experience symptoms related to muscle pain and chronic fatigue. Magnesium malate is the supplemental form used most often with fibromyalgia. Malate, a Krebs cycle intermediate, is believed to be able to feed directly in to the Krebs cycle when taken as a supplement. This helps to increase energy production, and improve the fatigue associated with the condition. Clinical trials show that magnesium malate was able to reduce muscle tenderness, and improve fatigue in people with fibromyalgia (9). Magnesium plays a well understood and vital role in maintaining good health. It is also highly effective in the treatment of many disease conditions. Despite its obvious importance, the magnitude of magnesium deficiency in our population is only getting worse over time, and no one seems to even notice. It is for this reason that magnesium reigns as the most underrated mineral. 1. Marz R. Magnesium. In Marz R. Medical Nutrition from Marz. USA: Omni-Press; 1999. p. 103-7. 2. National Research Council. Dietary reference intakes for calcium, phosphorus, magnesium, vitamin d, and flouride Washington, DC: The National Academies Press; 1997.Marz R. Magnesium. In Marz R. Medical Nutrition from Marz. USA: Omni-Press; 1999. p. 103-7. 3. Lindber J, Zobitz M, Poindexter J, Pak C. Magnesium bioavailability from magnesium citrate and magnesium oxide. J Am Coll Nutr. 1990; 9(1): p. 48-55. 4. Hampton E, Whang D, Whang R. Intravenous magnesium therapy in acute myocardial infarction. Ann Pharmacother. 1194; 28: p. 212-19. 5. Noppen M, Vanmaele L, Impens N, Schandevyl W. Bronchodilating effect of intravenous magnesium sulfate in acute severe bronchial asthma. Chest. 1990; 97(2): p. 373-76. 6. McLean R. Magnesium and its therapeutic uses: A review. Am J Med. 1994; 96: p. 63-76. 7. 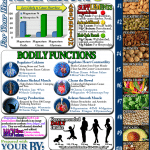 Piesse J. Nutritional factors in the premenstrual syndrome. Int Clin Nutr Rev. 1984; 4: p. 54-81. 8. Hallson P, Rose G, Sulaiman. Magnesium reduces calcium oxalate crystal fomration in human whole urine. Clin Sci. 1982; 62: p. 17-19. 9. Abraham G. Management of fibromyalgia: rational for use of magnesium and malic acid. J Nutr Med. 1992; 3: p. 49-59. Ooh wow, I didn’t know all of these things about Magnesium. This is so interesting and I’m super excited to learn some more great!